The word brings to mind visions of a slimy and very unattractive "shell-less terrestrial gastropod mollusk". We had property in the Santa Cruz mountains when I was a kid and still vividly remember the overabundance of these nasty things that slithered about; seemingly present beneath every slimy step I took. But slug can also be a good thing,"slug plate". As in western whiskey. The first really good bottle that I ever had was a Standard Old Bourbon slug plate. I recall staring at that thing for hours; marveling at the crude top, the heavy embossing and the character. As my focus became clearer over the years, and I concentrated my interests on rare pictures and the "big dogs", I let the Standard slip away. Not sure what became of it. Nothing in my records, and I don't recall selling or trading it. But just the same it was gone. I recently purchased a nice grouping of better western fifths. In the bunch was another Standard. This is a slug plate that just doesn't become available very often. In fact, I can count on one hand the number that I've seen over the years. I've got a few other slug plates on the shelf. All of the above, including the Standard, were blown in S.F. Another favorite, that once graced my shelves was a Renz's Blackberry Brandy. With the exception of the Renz, all are surprisingly well made considering their age. The tops are pretty sloppy but, for the most part, they are pretty much void of crudity in the body. On the flip side, the range of color makes up for the lack of character, and keeps them from looking like a line of soldiers standing at attention. The red whittled "German Connection" Wolters Bros. slug is the eye popper of the lineup; loaded with both color and crudity. I've heard it said that the slug plates can be broken up into a "true (or indented) slug plate" that is recessed, and a "raised (ridge) slug plate". All the examples that I've got have a raised ridge border. I truthfully don't recall seeing any that have the plate area simply sunken into a dedicated front "half mold". 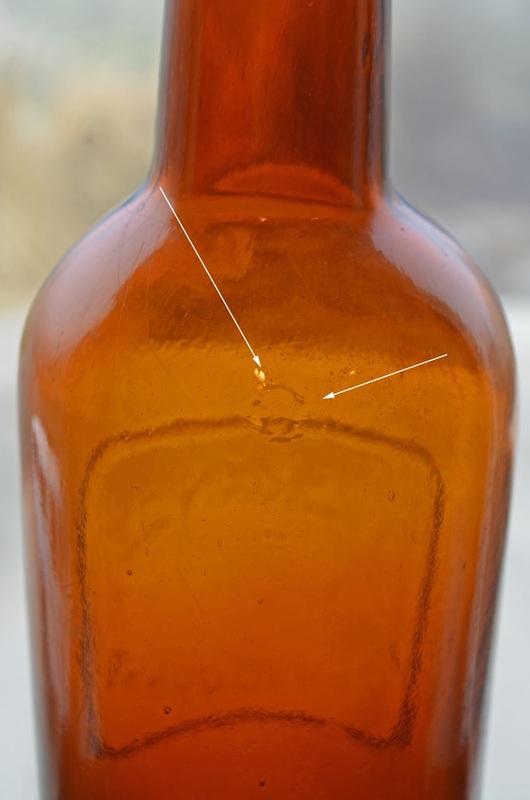 I went so far as to pull out the newer Thomas book and Wilsons Spirits Bottles of the Old West, hoping to catch a glimpse of the elusive "true (or indented) slug plate". All for naught. I wonder if it really exists? In fact, the only major difference that I've noted is that some have a large blob type air vent on the front and back shoulder. The Our Choice and N. Grange have this style of venting. The others do not. Slug plates, although scarce compared to many of the more elaborately embossed western glop tops, don't seem to have as much appeal to collectors; primarily because of the lack of embossing coverage. One has to wonder why some liquor wholesalers chose them to begin with. Sadly, the glass house records dating to the slug plate era went up in smoke in 1906. As such, one can only guess that price was the driving factor. Best guess is that it would be quicker, and hence cheaper, to emboss a couple of lines in a removable slug plate than to create an elaborate half mold with full faced embossing. 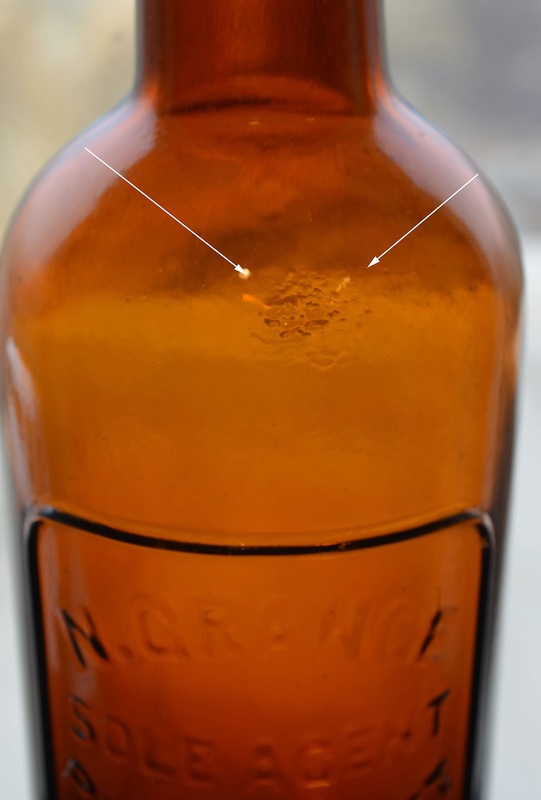 Something else to consider is that the pretty embossing, which we now consider the front of the bottle, was in reality the rear (or reverse). The label side was actually the front of the bottle. With few exceptions, given equal color and crudity, most collectors are drawn to more heavily embossed cylinders. That despite the extreme rarity of many of the slugs. The combined total of the top five slug plates; Palmtag & Bernhardt, Hotaling P.S., R.T. Carroll, Wolf - Janes and Wheeland & Collins number less than 10. Yes, less than Ten Total combined examples known. And yet, given the choice, I'd wager to say that most collectors would choose a Millers Extra, a Chevalier Whiskey Merchant or a Cassin's Golden Plantation (more than 30 known of just these three) over the top five slugs. Although not quite the Rodney Dangerfield of western whiskies, the slug plates certainly don't bask in the limelight or get the respect that they deserve. From Whiskey Seat, to Beer Seat, to Hot Seat. Many of us have kept an eye on the tale of two seats playing out this week. One on ABA, the other on eBay. eBay's listing has had an offer. It was apparently rejected as the listing is still active. ABA's listing is through the roof. Bidding stands at $3200~ tonight. Simply astonishing. Something caught my eye when comparing the photos of the two this evening. They are slightly different (besides the missing foot on the eBay offering). It's a phrase that can mean many things. Some positive, like when you show up at a good friends place as they pour you a cup of hot coffee. Some not so good, like when your pissed off boss calls you into his office. And then there's the "one of a kind" seat / seats that pop up all of a sudden. I was summoned to attend to a family emergency a little over a week ago. I had limited access to email, and like access (or thereof) to the internet. Last night, I rolled in after nearly nine hours on the road and settled in to open a mountain of mail, scroll through over 100 emails and to check on the "web". Who woulda thought. Not one, but two, rare seats. Well actually chairs. But rare just the same, I guess. We've been active in the western antique arena since the mid sixties. 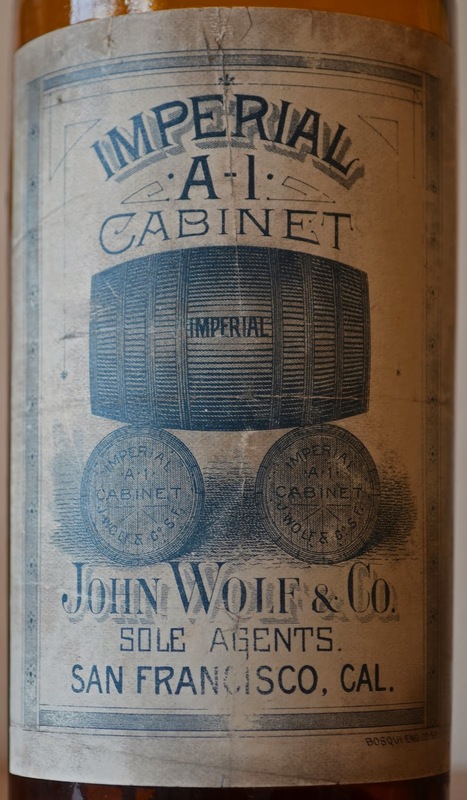 My wife and I had a retail location for many years, with a focus on (go figure) western whiskies, as well as American antique oak furniture. 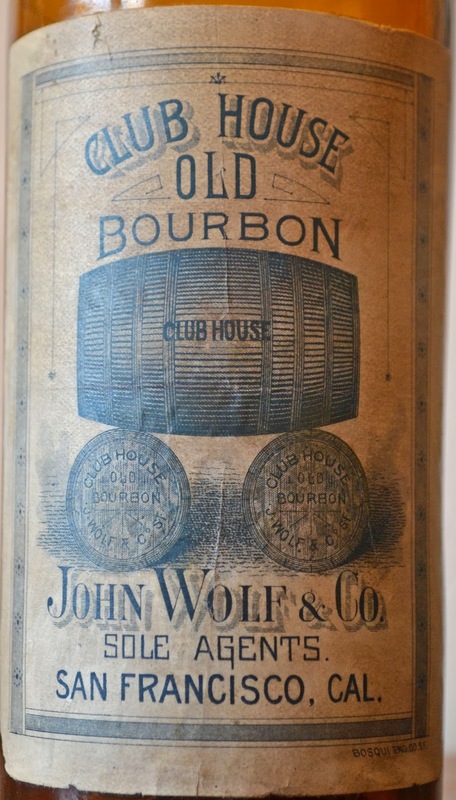 Lot #33 in American Bottle Auctions hard copy catalogue caught my eye. Neat piece to say the least. A quick look at the ABA lot #33 web page showed several closeup photos. Quarter sawn, brilliant flame grained tiger striped golden oak that appears from the photos to be domestic; as opposed to the ruddy European equivalents that flooded the US antique market in the late 1970's and 80's. It caught my eye for a couple of reasons. First and foremost is that I have assisted the decendents of James (not John...) Shea re-obtain a great deal in the way of familiy memoarbilia over the years. I thought, at first glance, that it may be a fit for one of them who resides in the S. F. Bay Area. Secondly, it's just plain neat. But the description included a lot of suppositions. To be fair, when something this unusual pops up, it's sometimes tough to come up with the facts, and nothing but the facts... ABA attributed the chair to the Shea Bocqueraz Co, of S.F. based on a logo that is present on the upper half of the chair; SB Co. If so, the chair would date to ca. 1903, the time that the vertically embossed fifth mold was slugged out and modified for the final time with a "dash" instead of "&" to reflect dropping the "&" Co. from the corporate name, until 1917 when the company closed it's doors. That in turn puts the chair into the transitional period of Victorian furniture style and on into the Arts & Crafts (or Mission) era. Based on the style of the legs, and the color of the stain, the carving and the type of finish, the age of the chair could conceivably be a fit to either of these styles. Following please find the published description. "SB CO XXXX W. with inscribed anchor. Oak chair measures 41” high, seat is 18” wide. 1897-1917. When we first got a glimpse of this chair we knew it was something special. 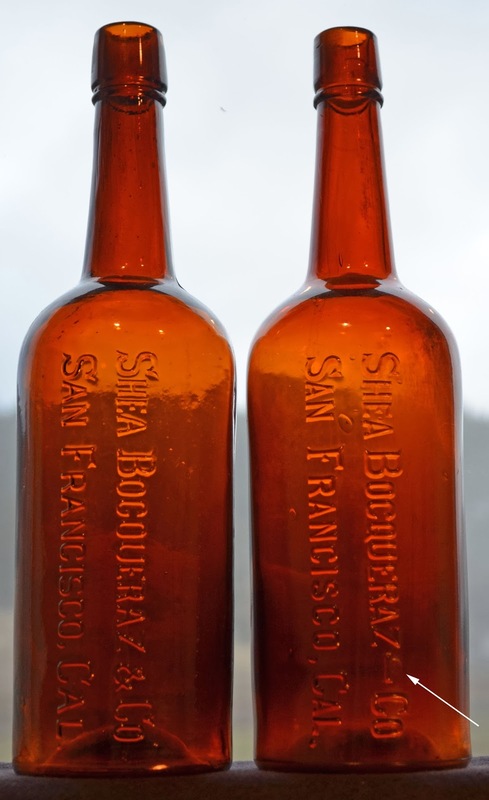 As we did more investigation, we realized it was made for the Shea Bocqueraz Company in San Francisco (see previous lot.) The initial partnership of former Boston resident John Shea, Antoine Bocqueraz and Robert McKee began in 1871 at Front and Jackson Streets in San Francisco. Robert McKee, who ironically first brought the Tea Kettle brand to the partnership, left the company in 1895 or 97 depending on who you read. The company was listed at 527 Front (1896-1898), 525 Market (1899-1906), 509-517 Mission (1907-1917). 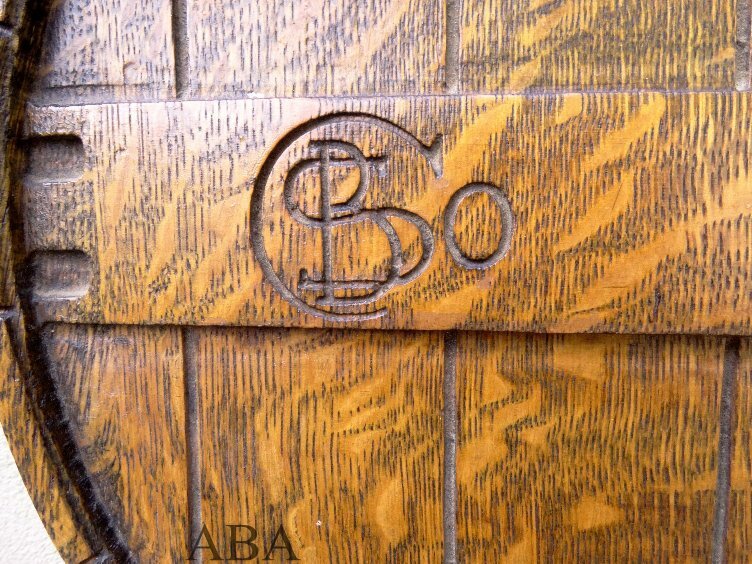 So we can ascertain that the chair was made around the turn of the century or within the 19 years while the Shea Bocqueraz Co. (1888-1917) was located at the 525 Market or the Mission street addresses in S.F. Now that the chair is safely in our offices, we are delighted to be able to offer it in our 59th auction. 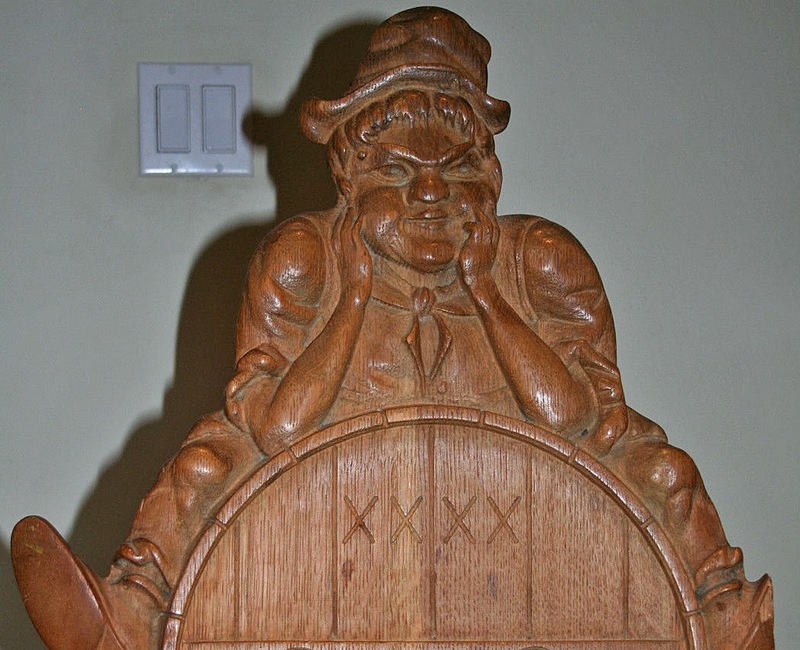 The chair is made of quarter-sawn oak (cut at an angle to enhance the grain of the oakwood)and the backing, which is all one piece, has a hand carved imp sitting on a barrel of whiskey. Our first thought was that it was an advertising piece given to top customers but considering the scarcity, this chair was undoubtedly made as a presentation or commemorative piece. Beautifully crafted, this piece had to have been made by a well-know or at least advanced woodworker, probably in San Francisco. Notice the rich golden patina of the oak wood, untouched but used for over 100 years. 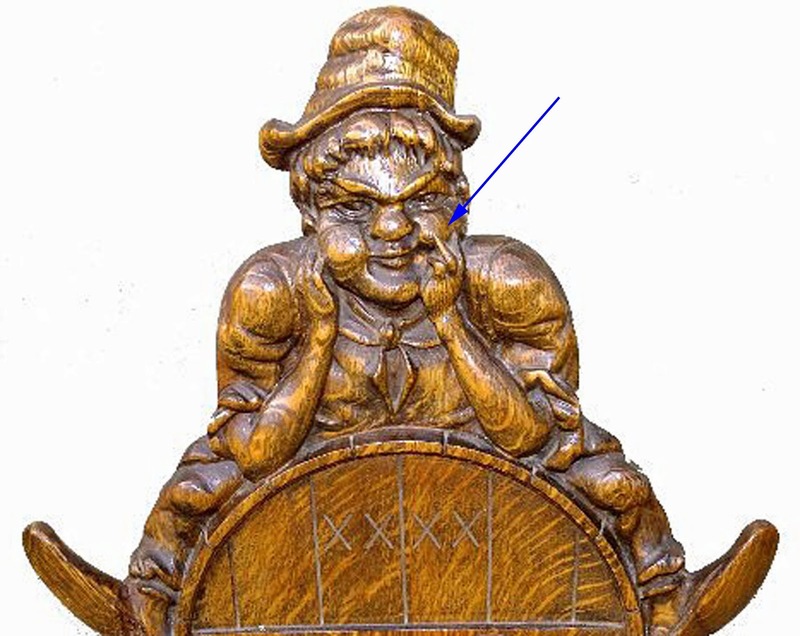 The imp, or Irish Leprechaun has large dangling feet and an amazing caricature of the figure atop the back, all made from one piece of wood. It’s known that James Shea came from Skibbereen, Cork, Ireland was of Irish decent which might explain the imp. The “W” might stand for whiskey while the anchor could be a brand although we are still investigating the various nuances of the chair. 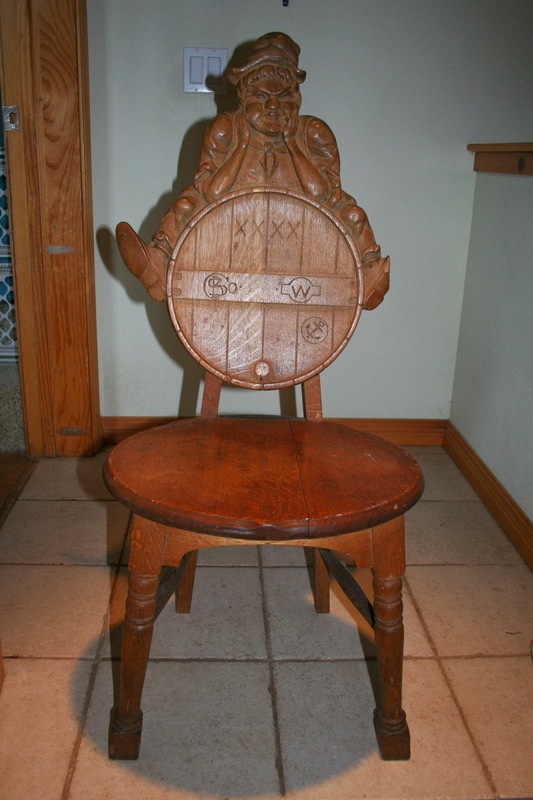 We hope to have additional information online on this outstanding and historically significant oak chair. 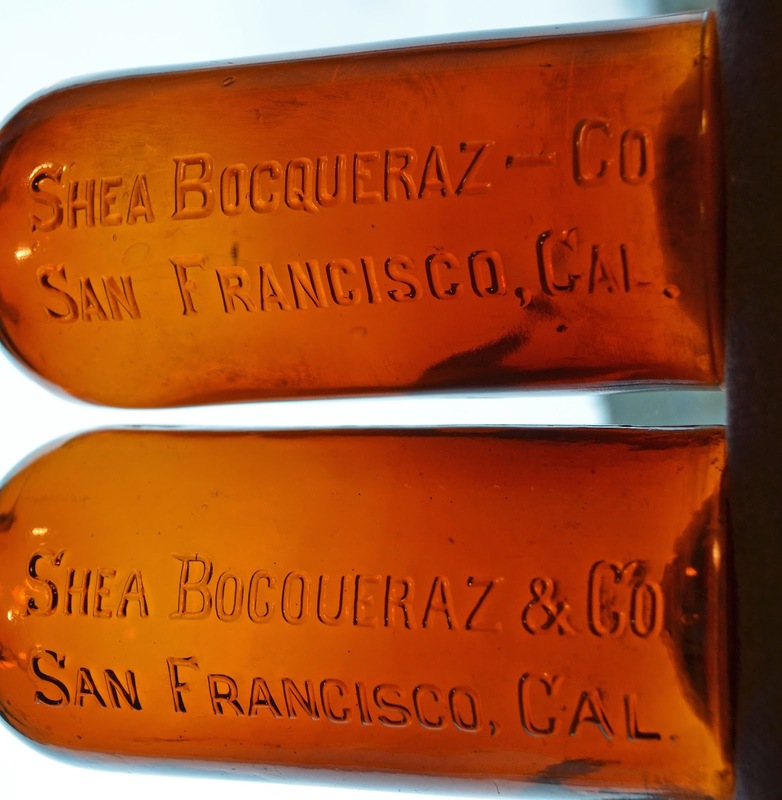 Shea, Bocqueraz were either partly or wholly responsible for the Teakettle, Tea Cup, Roanoke Rye, Golden Pony, Springfield and Carlton Rye whiskey brands. This item came ironically enough from a consignor in Illinois. Condition is all original. A terrific presentation or commemorative piece. 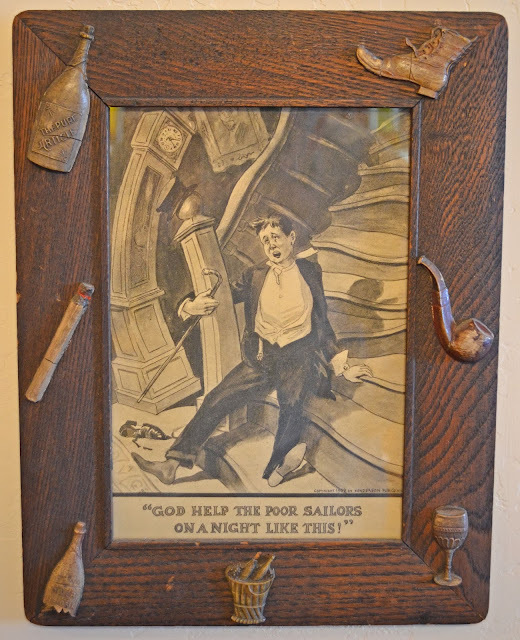 Surely a high-point for any saloon or early whiskey collector’s showroom. In addition, we are adding a brass marker found on a whiskey barrel that reads "The Tea Kettle Celebrated Distillery Pure Copper Whiskey Trimble Co. Kentucky with a pictured teakettle," will be added to this lot. It was given to us as a gift by an individual who may or may not have been aware we were selling a chair that would go perfectly together. Regardless, the chair and medallion come as a lot of two." In the description, I noted that the chair was consigned by an eastern owner who lived in Illinois, where the chair had apparently resided. Quite a distance from Sacramento, where ABA is located. This didn't come as a great surprise, as I've purchased quite a bit in the way of western whiskeyana from the eastern states over the years. What did come as a bit of a surprise was the "enthusiastic" pre-auction estimate of the hammer price; $2,000.00 -$5,000.00. Wowsa. 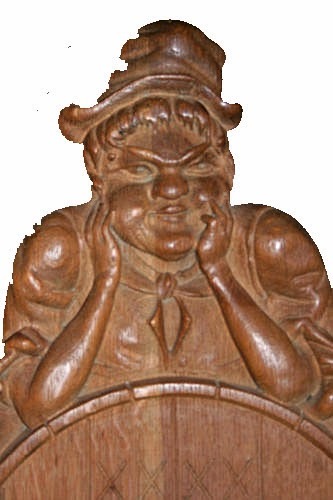 We sold a lot of high end western oak pieces in the way of sideboards, mantle surrounds, curved glass china cabinets, roll top desks and so on, at the top of the market, and none ever approached this lofty figure. OK, so much for the first seat. But imagine my surprise when I took a break from the USPS deliveries and email, and looked at the fresh fodder on eBay. eBay item number: 201012526242 has a virtually identical piece (albeit with a "handicapped" left foot), listed with a buy it now for, coincidentally, $4999.99~. 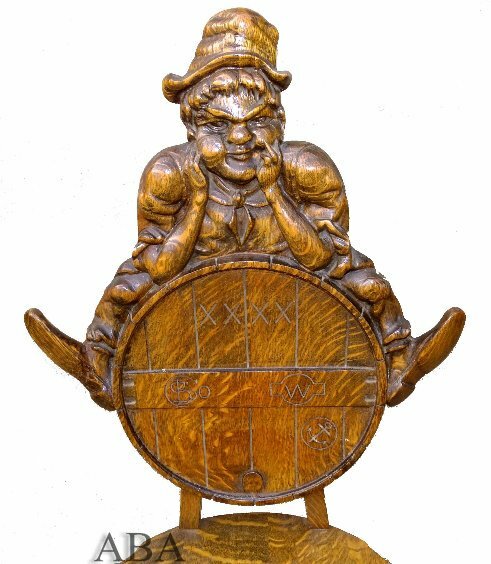 Here's their description; THIS IS AN EXTREMELY RARE ANTIQUE SHEA BOCQUERAZ & CO. (1888-1903 DISTRIBUTORS OF TEACUP AND TEAKETTLE WHISKEY) SAN FRANCISCO BASED OAK ADVERTISING CHAIR. IT IS IN OVERALL GREAT CONDITION CONSIDERING ITS AGE, BUT THERE ARE A FEW THINGS I'D LIKE TO POINT OUT. THE FIRST CAN BE SEEN IN PHOTO #7…THE CHAIR SEAT APPEARS TO BE 3 PIECES OF WOOD PUT TOGETHER AND YOU CAN SEE HOW THE SEAM HAS COME APART ON THE MIDDLE AND RIGHT PIECE OF WOOD LEAVING A SPACE BETWEEN THEM. THE SECOND PROBLEM CAN BE SEEN IN PHOTO #12…THE LEFT FOOT TIP OF THE LEPRECHAUN HAS BEEN BROKEN OFF AND IS MISSING. 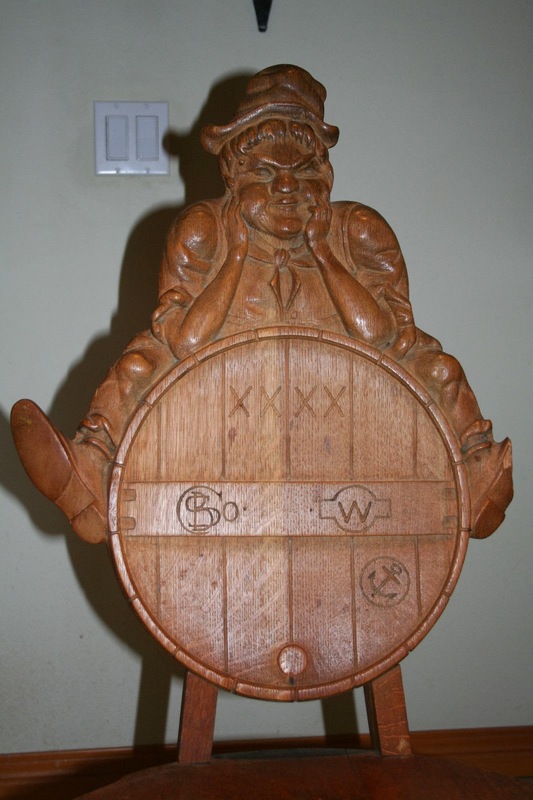 AND OTHER THAN BEING A LITTLE DIRTY ON THE BOTTOM (PHOTOS 10,11), THIS CHAIR IS A FINE EXAMPLE OF EARLY LIQUOR DISTRIBUTORS PROMOTIONAL GIVEAWAYS!!! THIS WOULD MAKE AN EXCELLENT ADDITION TO ANY COLLECTION!!! So much for unique. The seller resides in Truckee, just east of Sacramento. On the flip side, if you're in the market to spend $5k for a chair, they're located pretty close to one another so that you can touch and feel both, hands on, before making a decision to "have a seat". ____________________________________________________ Just got a call from a good friend over in the Washoe about chair #2. Turns out it was recently purchased at an auction in Reno. Purchase price... a little over $700~. Just about in line with what Dennis mentioned as a fair value in his comment. Happy New Year 2014 to all.